It is through a Martyr's palm-branch that we must today see the Paschal Mystery. 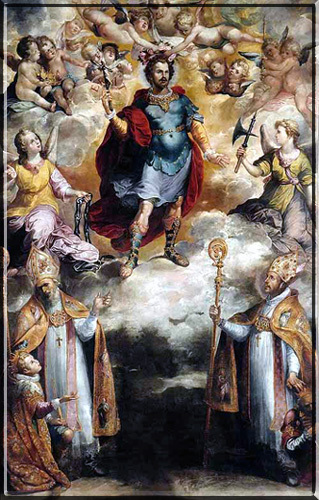 Hermenegild, a young Visigoth Prince, is put to death by his heretical father, because he courageously refused to receive his Easter Communion from an Arian Bishop. The Martyr knew that the Eucharist is the sacred symbol of Catholic unity; and that we are not allowed to approach the Holy Table in company with them that are not in the true Church. A sacrilegious consecration gives heretics the real possession of the Divine Mystery, if the priestly character be in him who dares to offer Sacrifice to the God whom he blasphemes; but the Catholic, who knows that he may not so much as pray with heretics, shudders at the sight of the profanation, and would rather die than share, by his presence, in insulting our Redeemer in that very Sacrifice and Sacrament, which were instituted that we might all be made one in God. St. Gregory the Great, a contemporary of St. Hermenegild, has transmitted to us the following account of the martyrdom. The Church has inserted it in her Second Lessons of today's Matins. From the book of the Dialogues of Saint Gregory, Pope. It was the Feast of Easter. At an early hour of the night, when all was still, his wicked father sent an Arian Bishop to him, with this message, that if he would receive Communion from his hands, (the Communion of a sacrilegious consecration!) he should be restored to favour. True to his Creator, the man of God gave a merited reproof to the Arian Bishop, and, with holy indignation, rejected his sinful offer; for though his body lay prostrate in chains, his soul stood on ground beyond the reach of tyranny. The Bishop therefore, returned whence he had come. The Arian father raged, and straightway sent his lictors, bidding them repair to the prison of the unflinching Confessor of the Lord, and murder him on the spot. They obeyed; they entered the prison; they cleft his skull with a sword; they took away the life of the body, and slew what he, the slain one, had sworn to count as vile. Miracles soon followed, whereby heaven testified to the true glory of Hermenegild; for during the night, there was heard sweet music nigh to the body of the King and Martyr,--King indeed, because he was a Martyr.